A year on from the death of Michael Brown, the black teenager killed by a policeman in Ferguson, Missouri, Reggie Yates examines the position of African-Americans in US society. 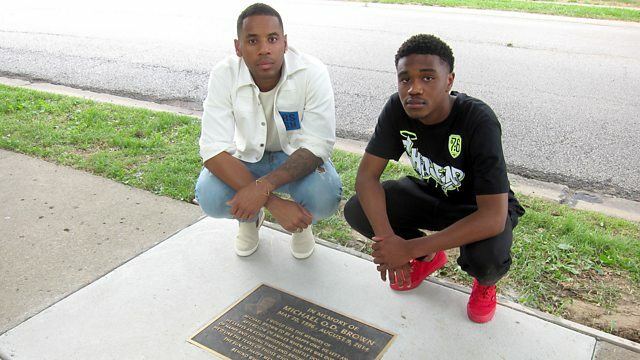 A year on from the death of Michael Brown, the unarmed black teenager killed by a policeman in Ferguson, Missouri, Reggie Yates examines the position of African-Americans in US society. Brown's death, in addition to other incidents of police brutality, shocked the world and led to sustained rioting in Ferguson. Reggie visits the small town in America's Bible Belt and discovers that the events of August 2014 have politicised a new generation of young activists. He seeks to find out from the citizens of Ferguson whether the community can ever be healed. Reggie looks at new police recruits being trained but goes on to discover how African-Americans are still being discriminated against. Reggie Yates has travelled the globe investigating what life is like for young people. BBC Three gets under the skin of racism.